Cozy Fall Outfits | The New LIVING IN YELLOW x Gibson COZY Collection is live! My dear friend Erin’s new cozy line of apparel with Gibson launches TODAY at Nordstrom and it’s so good! #GibsonxLIY I’m so proud of her and she’s truly one of my favorite people I’ve met through blogging. She’s the real deal and just so genuine and kind. I just wish we lived closer! I know these pieces are going to go fast, so definitely don’t wait to check out today! I only say that on rare instances, like with the Nordstrom Anniversary Sale, so that you can be prepared and get your cute little fingers on your faves before they sell out! Now let’s get to it! You can’t talk about cozy without mentioning the Cozy Cardigan! You guys probably already know and love it, but if you’ve been in the dark and need a lesson, this is just one of those super soft and cozy pieces that you want to cuddle up with all year long! I have two for myself and have given them as gifts to friends and family and they are always the most treasured gift. Often, my son sneaks into my closet and steals mine because even kids are smitten with the soft and cozy material. They run true to size, income in several colors with pockets. Are used to think they were meant for only at home, but then I got wise and started wearing them out and about and they are especially good for traveling. For a double dose of cozy, I wore the Ann Racerback Swing Tank aka “cozy tank” underneath and it is that super soft material that feels so good against your skin. I was so surprised that they made a tank in this fabric, but I think it’s genius! It’s racerback style and hem is a curved shape that’s super flattering. I’m wearing the feminine ‘pink smoke’, but it also comes in black, grey and hot pink. I wish you could feel through the computer how soft it is, but you’ll just have to order for yourself! You might not think of Spanx leggings when you think of cozy, but want to get these things on, you feel so smoothed and confident and ready for lounging or errands. Not to mention that faux leather look is also hot for dressing up for date night! You guys heard me raving about these joggers in last weeks dressing room post, and they have been on repeat ever since I got them. In fact, I can’t believe I didn’t get them sooner. You have to trust me on this one, you need these in your life! They are from Erin’s first collection with Gibson and have been so popular that Nordstrom has kept buying them all year. That’s good news for you, because they are still in stock in all sizes and also come in black. I actually wore mine all weekend and out to the grocery store- so you can take them out of the house, although you’ll probably just want to cozy around in them! I have a decent bit of stretch, fitted angles and a comfortable drawstring waistband and pockets! JOGGERS FIT: TTS, I’m wearing my regular size XSP. I also tried sizing down, but they were too tight. It’s hard to play favorites with the pieces in Erin’s collection, but this is one fo my faves! It’s also in that soft, cozy fleece material and has the look of a sweatshirt, combined with an off-shoulder style. It comes in 5 colors, I’m wearing the ‘deep violet’ but I really LOVE the grey leopard. I’ll definitely be ordering that one STAT! I wore my top with my strapless bra, but I also think it’s darling with the pretty bralette peeking through. It comes in 5 colors, I’m wearing the ‘deep violet’ but I really LOVE the grey leopard. I’ll definitely be ordering that one STAT! 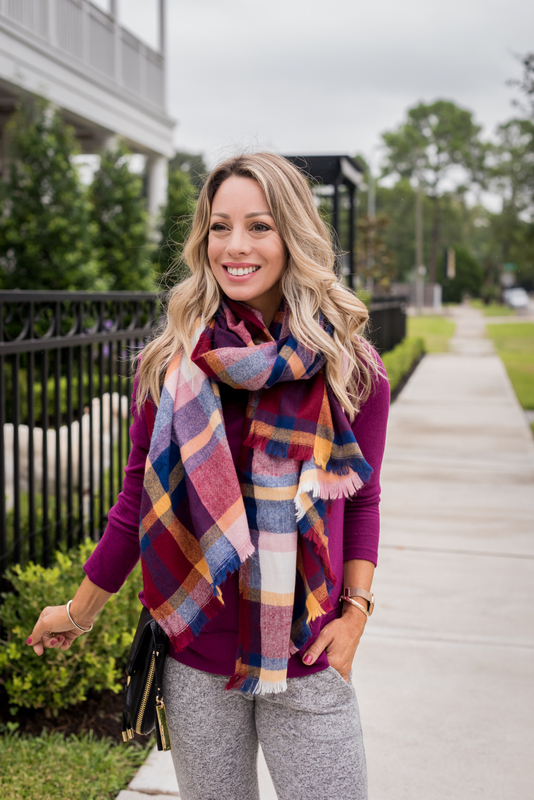 Here, I love how the purple looks with this colorful plaid scarf. I know most of us reach for our jeans most often and I have to super cozy pull overs to share with you! First up, is the plush fleece standing collar top. It has a front kangaroo pocket and cute thumb holes at the sleeve. I was torn over what color to choose because it comes in ivory/navy, grey/deep charcoal, and the pink/white I’m wearing here. TOP FIT: TTS, I’m wearing Small Petite, but probably would prefer my regular XSP. 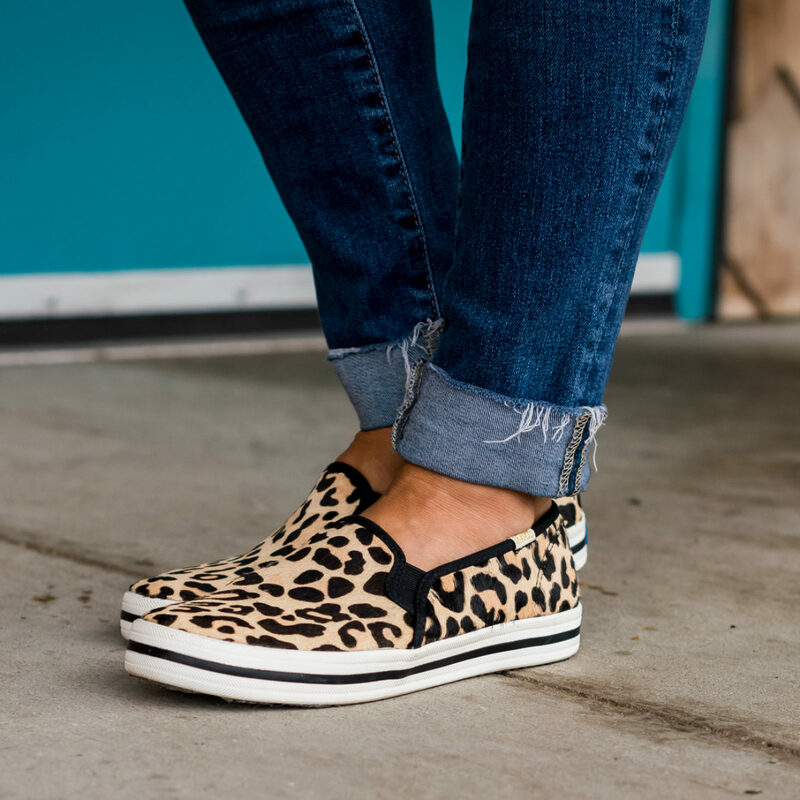 You’ve been seeing these leopard print sneakers a lot lately, and that’s because they are so comfy and cute. I love the pop of fun they add to the outfit! 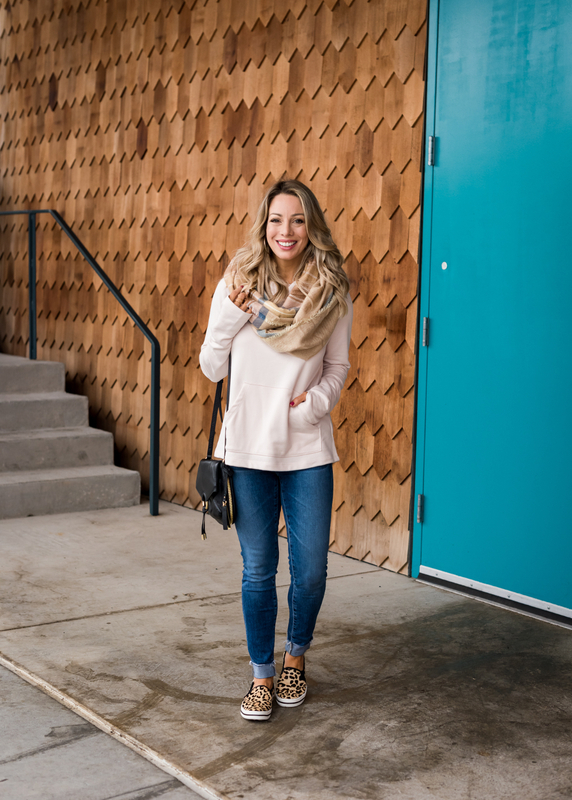 The infinity scarf we all loved last year (in the aqua/red colorway) is back this year in this subtly hued pink and tan with a bit of grey blue. This turtleneck neck pull over has been a favorite of y’all recently and I can see why! The neck is loose and relaxed and the criss cross can be worn in the front or back. This isn’t from Erin’s collection, but it’s by Gibson and in that same cozy, fleece material we all know and love! On this day, I wore the criss cross in the back, but it also looks great worn in the front. AND, it’s particularly handy for you nursing mamas! Although it’s not an outfit, I can’t write a post about cozy goodness without mentioning the barefoot dreams cozy blanket! We love this thanks so much that we bought two, one for downstairs on the couch, and one for upstairs. 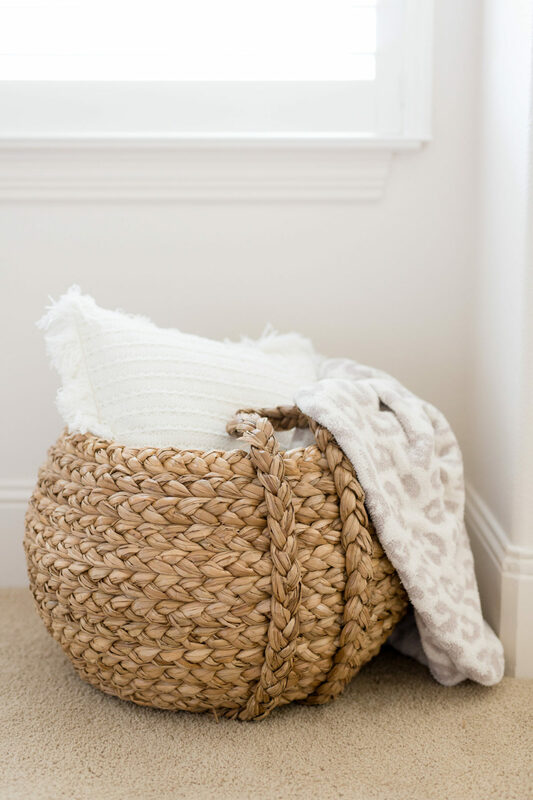 It’s the blanket it we all reach for when we went to cozy up and lounge around and it is definitely worth the splurge! We have the animal print that has recently sold out, but it comes in solids, stripes and even a new print. These also make a great gift if you’re starting your Christmas shopping early! Thank you to Nordstrom for sponsoring today’s post! I’m sure you’re all familiar with Nordstrom’s awesome customer service and FREE shipping and FREE returns, but did you know that you can buy online and pick up in store or reserve online and try on in the store? And, they have free curbside pickup if you order online and head to the store to pick up your order. I often do this if I don’t want to wait for shipping. You just pull up to the pickup door, call them, and they come out with your order. You don’t even have to get out of your car- and sometimes that’s just what you need when you have your feisty toddler in tow! I just the red on you. Would you mind sharing how the sizing is on the red criss cross top? Hi Toni! Thanks so much! It fits TTS, I’m wearing XSP. This has nothing to do with your post but I was wondering if you are still taking BCAA? I checked bodybuilding.com but the exact formula you showed is no longer available. Thanks! Very cute pieces. I’ll definitely be ordering some. Daylight Saving Time is actually ENDING this coming weekend. It started in March. Oh My! Did I miss the link to the chenille looking oatmeal infiniti scarf in the photo with the faux leather leggings? I have to have that! Could you tell us your thoughts on the sizing on the off the shoulder violet/purple top? Thanks! Hi Lori, I’m wearing my regular size, XSP in that top.